Pulkovo Airport is located in 23 kilometers from the center of St. Petersburg and is the third in Russia in carriage volume after Domodedovo and Sheremetyevo. 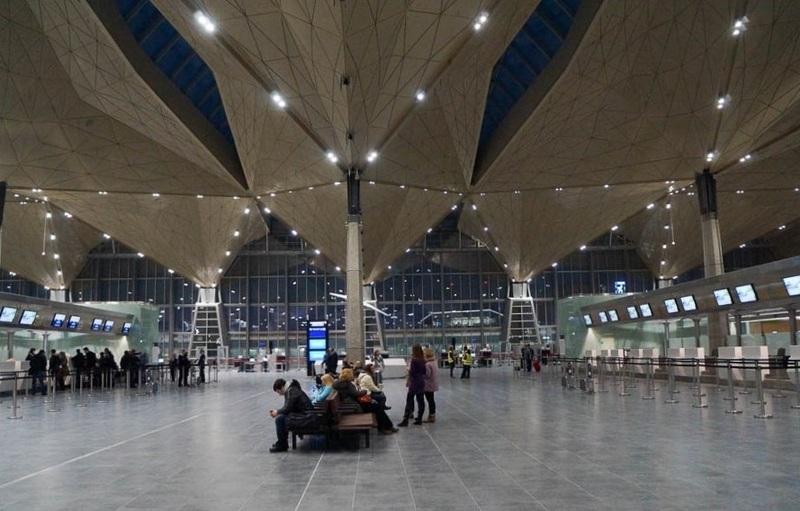 In December 2013 an important event took place in the life of St. Petersburg - the new terminal at Pulkovo Airport accepted its first passengers. The airport has been built during 40 months; this is an unprecedently short time in Russia for facilities of such level. 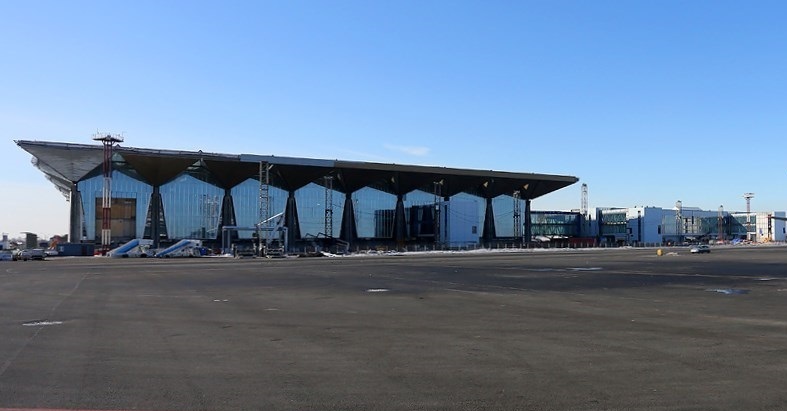 The new terminal is equipped in accordance with the latest achievements of technologies and according to experts everything was done here for the convenience and comfort of passengers. The platform area of ​​the new airport has been almost doubled and numbers 450,000 square meters instead of 250 thousand square meters of old terminals. All the services of the aerocomplex are equipped with the latest technologies. Designing of the airport Pulkovo was entrusted to the British architectural bureau - Grimshaw Architects. Created by the masters the image of the airport reflects the view of the historical buildings of the Northern capital and will remind you the grand halls of the Hermitage as well as the precise lines of architecture of the Soviet era. The roof of the building in the light of the sun seems golden and something looks like the gilded domes of the temples of the Northern capital. 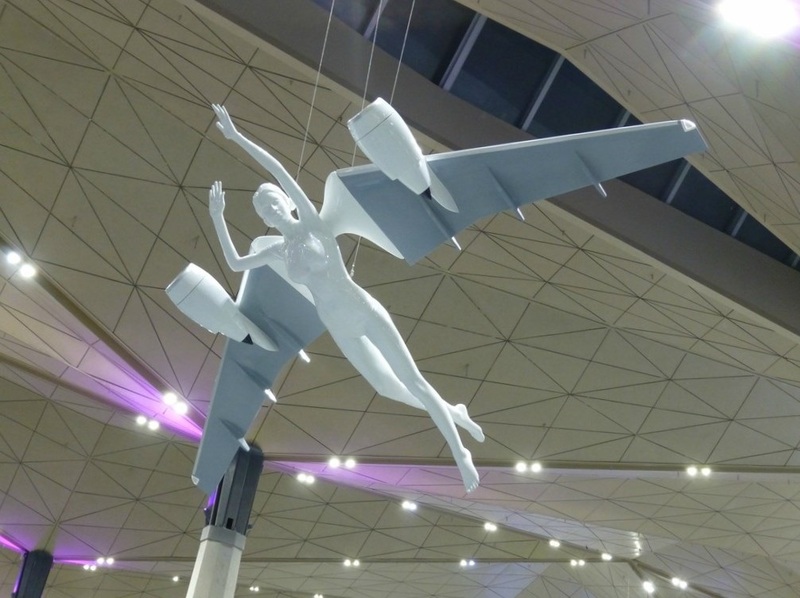 The curved wavy ceiling inside the building imitates the Neva's surface, the author's sculptures of the girl-planes are unusual and the transition from the registration area into that part of the terminal that is located beyond the border control zone will remind us the bridges of the Northern capital. The new terminal will not have queues in the cabins of passport control - there are 110 cabins here and the registration area, divided into two parts - for passengers of domestic flights and for passengers of international flights, there are 88 racks in total. There will be no agiotage also during receiving of baggage, seven baggage-carousels are installed for its delivery. Seventeen exits for landing have been equipped, for the convenience of passengers the aerocomplex is equipped with 14 teletraps, there are 17 escalators and 45 lifts, all conditions for people with disabilities are created. The aerocomplex has two parallel runways. The width of the runway reaches 60 meters, the length of the South runway is 3780 meters and the northern one is 3397 meters, the cover is cement-concrete. Not far from the Highway platform near Leningrad in the early 30-ies aerodromewas built. In June 24, 1932, the first two planes have landed here delivering passengers and mail from Moscow, this significant day became Pulkovo Airport's birthday. Besides the flights to Moscow, there are also flights to other regions of the country - to Petrozavodsk and Arkhangelsk, Murmansk and Kiev. The fleet of equipment has been replenished and flights have started to be carried out on more capacious aircrafts as G-2, PS-40 and PS-84. In 1936 a new terminal building was built and flights between two capitals became regular. After the beginning of the Great Patriotic War, the airport was on the front line and the air squadron was transferred to the airfields Smolny and Komendantsky. In difficult military days, the airmen delivered valuable goods to the besieged Leningrad with products, weapons and medicines. After the ending of war, flights to the union republics and many neighboring regions have began.In the 1950s, with the development of Soviet aviation, theHighway aerodrome also has changed.In 1951 a new building of the station was opened, designed by the architect Alexander Ivanovich Gegello-Pulkovo-2. The flights are beginning on the An-2, Il-12 and Il-14, and since the mid-1950s the time for jet technology has come. Pilots and technical staff of the aerodrome were trained to operate the Tu-104 jet and Il-18 turboprop.The new An-24 and Yak-40 aircrafts allowed to expand the geography of flights and the citizens of Leningrad could fly to Vladivostok and Petropavlovsk-Kamchatsky. With the introduction of new equipment in the 1960s, planes began to land automatically in weather conditions in the first category of ICAO, which allows landing with a visibility on the runway not less than 550 meters and with minimum cloud height not less than 60 meters. New navigation equipment has been introduced, An-24 and Yak-42, Tu-134 and Tu-154 replaced old planes and An-12 became essential for cargo transportation. The safety and regularity of flights has increased and in 1971 Pulkovo airport had been awarded the Order of Revolution. In 1973 a new terminal Pulkovo-1 was built under the guidance of architect Alexander Zhuk, it had an original design, which is often called among people "the five glasses from above". On April 11, 1986, after the reconstruction, the renewed Pulkovo-2 airport terminal has opened, which began to serve twice as many passengers of international flights and for the first time a Tu-154 plane flied to Berlin from that airport. In 2005 the aerocomplex became an independent enterprise and in 2007 100% of its shares, which are in federal ownership, was transferred to the Government of St. Petersburg. According to the General Plan for the development of the aerocomplex until 2015 its modernization, further development of the infrastructure and the building of a new terminal are envisaged. The held contest for choosing a building investor defined the winner and it became the consortium "Air Gate of Northern Capital", which includes VTB Capital, Fraport AG which is the owner of the Frankfurt airport and Copelouzos - the Greek investment and financial company. St. Petersburg's Pulkovo Airport is one of the largest transport hubs in the Baltic region. In a year it will be able to receive up to 17 million passengers, which will contribute to the growth of the tourist flow to St. Petersburg and will increase the economic potential of the entire North-West region.